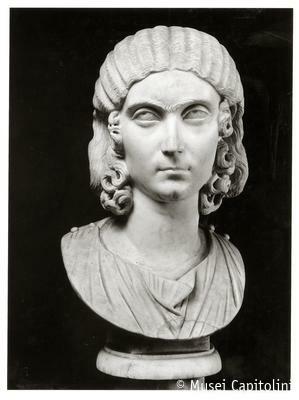 The portrait, set on a modern bust, features a young woman with the head slightly turned to right. The wide eyes, with irises and pupils incised, are surmounted by heavy eyelids and continuous eyebrows; the mouth is small and tight. The wig-like hair, parted in the middle, is arranged in wavy locks tied back on the nape; curly locks fall free just before her ears. The peculiar coiffure dates the portrait to the early 3rd century AD, the age of the Severan dinasty. Formerly in the collection of cardinal Alessandro Albani, the portrait was acquired for the Capitoline Museum in 1733.